Question 5 on the November ballot asks if voters want to switch to ranked-choice voting for the Legislature, governor and U.S. Senate and House. Poll after poll has found that Americans are fed up with Congress and think that partisanship has worsened in recent years. Ranked-choice voting, Question 5 on the November ballot, is presented as an easy way to solve these problems. With ranked-choice voting, supporters argue, Maine won’t have elections in which two reasonable candidates split the vote and a firebrand such as Paul LePage wins with far less than 50 percent support. Instead, the argument goes, candidates will have to cater to a broad spectrum of voters because they will need second-place votes in order to win in this new system, in which voters rank candidates in order of preference and instant runoffs are held until one candidate gets more than 50 percent of the votes. Candidates will moderate their message and attack one another less to get elected and, once in office, they’ll govern in a more reasonable way, the backers of Question 5 say. We remain unconvinced that changing the way Maine residents vote will suddenly bring all these positive benefits, just as term limits and public financing of campaigns have not dramatically altered the makeup of the Maine Legislature, how well it functions or the public’s perception of it. And, in a state where half the communities hand-count ballots, we fear voting and vote counting will become confusing, less transparent and burdensome, further eroding voter turnout and faith in our election systems and government. For these reasons, we recommend a “no” vote on Question 5. Many critics of Congress and the Legislature act as if politicians became polarized in a vacuum. These institutions, however, reflect the citizens who voted their representatives into office. Congress and the Legislature are more polarized because citizens, in Maine and around the country, are increasingly polarized. 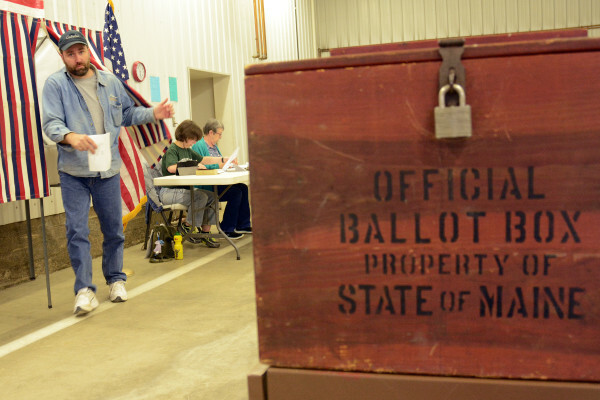 Changing how Mainers vote won’t change their core beliefs. The first step to a different Legislature or Congress is for a larger segment of the population to show up to vote. In November 2014, Maine had the highest voter turnout in the country when 59 percent of eligible voters went to the polls. That means that more than a third of registered voters didn’t cast a ballot, in a year with record turnout. Turnout at political party caucuses and in primaries is sometimes as low as 10 to 20 percent. Those who sit out elections are allowing dedicated voters — who are often the most partisan — to determine who will represent them in the State House, Congress and the White House. Through researching five San Francisco mayoral elections between 1995 and 2011, Jason McDaniel, a San Francisco State University political scientist, found that ranked-choice voting — which San Francisco has used for municipal elections since 2004 — can depress turnout, especially among younger voters, African-Americans and those with low levels of education. We wish that switching to ranked-choice voting would make campaigns and governing more polite and positive. It isn’t that easy, of course. The most negative television ads and campaign flyers come from outside groups, not candidates. Candidates, by law, cannot coordinate with those third-party groups, which have spent ever-increasing amounts of money to influence state legislative races, as well as congressional and presidential campaigns. These groups will continue their work to influence Maine elections, even if the state switches to ranked-choice voting. Ranked-choice voting, which a number of U.S. cities use, but no state, has the potential to change the outcome in a scant number of elections. The majority of legislative races include only two candidates and in each election, a significant number of State House candidates run unopposed. Ranked-choice voting will make voting and vote tallying more complex and error-ridden — based on the faint hope that it will make politics more civil.